T-bone accidents are some of the deadliest car accidents on the road. There are a few reasons for this. First, victims only have a door and window to protect them from the oncoming vehicle’s impact—especially dangerous if the vehicle is a larger passenger vehicle or a big-rig truck driving at a fast speed. 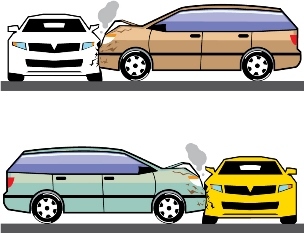 In addition, the force of the impact can easily push the victim’s automobile in a different direction, causing it to hit or be hit by another vehicle. Fortunately, if you are hurt in a side impact accident, you may be entitled to compensation for your losses from the negligent driver. Why Do T-Bone Crashes Happen? Failure to yield. Many of these accidents occur at intersections when the negligent driver fails to yield the right of way. This is a violation of traffic laws as well as negligence, with deadly results for the victims. Running a red light. Speeding through a red light is another common reason these accidents happen. Because the negligent driver is racing through the light, he can cause even more serious injuries. Improper left turn. Making a left turn either at a stop sign or stop light when a driver does not have the right of way will often cause a T-bone accident. Sometimes, the negligent driver’s vehicle is the one hit, causing injuries to himself and his passengers as well as the innocent occupant of the other car. Distracted driving. Drivers can become distracted for many reasons, such as eating and drinking, fiddling with vehicle instrument controls, talking on a cellphone, or texting. Whenever a driver’s mind and eyes are not on his driving, he is more likely to cause a dangerous T-bone accident. Reckless driving. Speeding and erratic lane changing are a few types of reckless driving that can cause a side impact crash. Driving under the influence. When drivers are under the influence of drugs or alcohol, their decision-making and reaction times are impaired. This can cause them to make poor judgments like speeding through a red light on purpose. Vehicle defects. While less common, vehicle problems, such as faulty brakes or a steering component defect, can cause a motorist to be unable to stop in time to prevent a T-bone crash. In this type of case, other parties as well as the motorist could be responsible for compensating the victim. Head injuries. Concussions, traumatic brain injuries, or cuts from shattered glass—sometimes to the eyes—can cause loss of vision and devastating changes to the person’s reasoning, decision-making, concentration, and memory. Neck injuries. When a person’s head snaps back from the force of the impact, he can suffer neck injuries like herniated discs or whiplash. While these conditions will sometimes heal, in other cases a person can suffer with long-term pain and limitations of movement that can require extensive medical treatment and affect his activities or ability to perform his job. Back injuries. These can also include herniated discs, nerve damage, or spinal cord damage that can cause chronic pain not only in the back but also radiating into other limbs or parts of the person’s body. If the spinal injury is severe enough, the victim could become partially or completely paralyzed. Chest, abdominal and pelvic injuries. A person can suffer serious fractures in his chest or pelvic region or internal organ damage and bleeding if the vehicle frame is crushed or the impact is severe enough. Prompt medical treatment is essential as the person may not experience the symptoms of internal organ damage or bleeding until days after the accident when the condition can quickly turn into a life-threatening emergency. Limb injuries. These can include fractures to the arms or legs or dislocated bones. Depending on the severity of the fractures, a person may need multiple surgeries to repair the damage. Soft tissue. Soft tissue injuries can include muscle, tendon, and ligament strains, sprains, and tears. While minor injuries could heal relatively quickly, others could require months or longer of physical therapy, medications, and surgery. If you or a loved one was hurt in a T-bone accident, our experienced South Carolina and Georgia car accident attorneys are here to handle the legal details of getting you the compensation you deserve so you can spend your time recovering from your injuries. Call us toll free at 888-795-6261 to schedule a free, no-obligation consultation to learn about your legal options. How Long Does It Take to Settle a Car Accident Case?